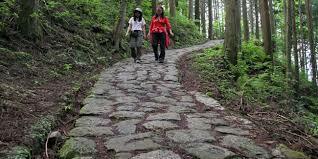 Walk the route taken by feudal lords, samurai, traveling merchants and pilgrims in seventeenth-century Japan. The Nakasendo Way literally means ‘the road through the mountains’. These days, this well-preserved path is a quiet respite from the busier roads of life. It is an easy journey, meant to be taken at a comfortable pace. The walking tour begins in the ancient capital of Kyoto, passes through picturesque old towns near Nagoya and finalizes in Tokyo. Accommodation in traditional Japanese inns, transport and assistance with baggage are all part of the experience. This entry was posted in Uncategorized and tagged climbing, countryside, feudal lords, highway, hiking, history of Japan, Japanese inns, journey, Kyoto, mountains, Nagoya, Nakasendo Way, path, paths, pilgrims, route, samurai, scenery, seventeenth-century travellers, Tokyo, tours, trails, travel walking, traveling merchants, trekking, Walk Japan, walking, walking tours, walkways. Bookmark the permalink.